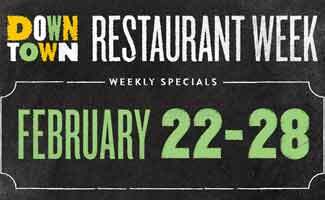 Restaurant Week in Downtown Winston-Salem will be held Monday, February 19 through Sunday, February 25, 2018. The event features many of your favorite downtown culinary destinations as they offer $20 and $30 dinner options the entire week! Restaurant Week specials are dine-in only, subject to change and availability, and exclude tax and tip. Reservations are recommended. Foothills is serving up a starter of salad, chili or soup of the day, one of two entree options and Papa Gists’ bread pudding. At Hutch & Harris, the Restaurant Week special is a jerk salmon with pineapple-jalapeno salsa over coconut rice with mixed vegetables and choice of starter. The Porch offers their Porch Taco Trio, avocado fries and a margarita for $20! Willow’s Bistro offers a both a three-course $20 special and $30 special of their gourmet local fare. At 6th & Vine choose a meal of mouthwatering options with two appetizers, two entrees and two desserts to choose from for $30. Mozelle’s is offering one of two starters, choice of two entrees and choice of two desserts for $30. For full details and restrictions, visit Downtown Winston-Salem Association. Which restaurant are you looking forward to most for restaurant week? Stop by Camino Bakery to pick up a bag of locally-roasted Krankies whole coffee beans and a loaf of bread for $20. At Hutch & Harris, the Restaurant Week special is a siracha-seared flounder over mushroom risotto, veggie and choice of starter and dessert. Misson Pizza Napoletana is offering a pizza of your choice, salad and dessert of the day for $20. The Porch offers a meal of avocado fries, taco platter and a margarita for $20! Kabobs is featuring Two kabob combos (chicken or lamb) with side, choice of dessert and two soft drinks for $30. Mission Pizza Napoletana is offering 2 pizzas of your choice or 1 pizza and 1 plate and dessert for $30. Mozelle’s is offering a yummy Southern selection of starters, choice of four entrees and a dessert for $30. The special for Hutch and Harris is incorrect. Thanks, Cara! This info was for last year’s Restaurant Week. We couldn’t find the 2017 Restaurant Week Specials listed. We hope you enjoyed Hutch & Harris. Great food there!